Happy holidays! 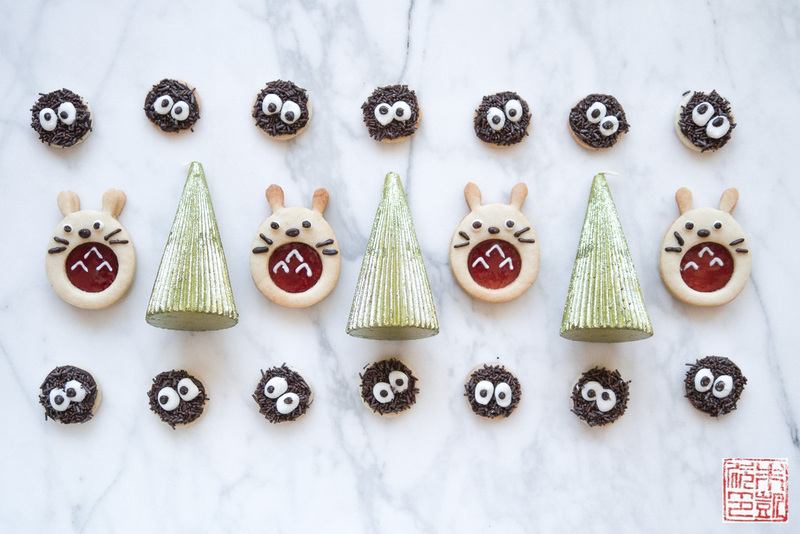 It’s the season of joy and wonder and wishes come true, and these Totoro linzer cookies might make it just a bit more magical. I was struggling for Christmas cookie inspiration this year. Rescue came in the form of Isabelle, who in just the last couple of weeks decided to fall in love with Totoro, the giant furry forest spirit from My Neighbor Totoro. This was one of my favorite animes when I was little, and seeing Isabelle take to it as readily as I did has been quite a joy. Hearing Isabelle sing the Totoro song around the house in her chirpy little voice, the answer became suddenly obvious: Totoro linzer cookies! I’d picked up these Totoro cookie cutters a while back but never got around to using them yet. The round cookie cutter meant for the tummy make these the ideal linzer cookie cutters. 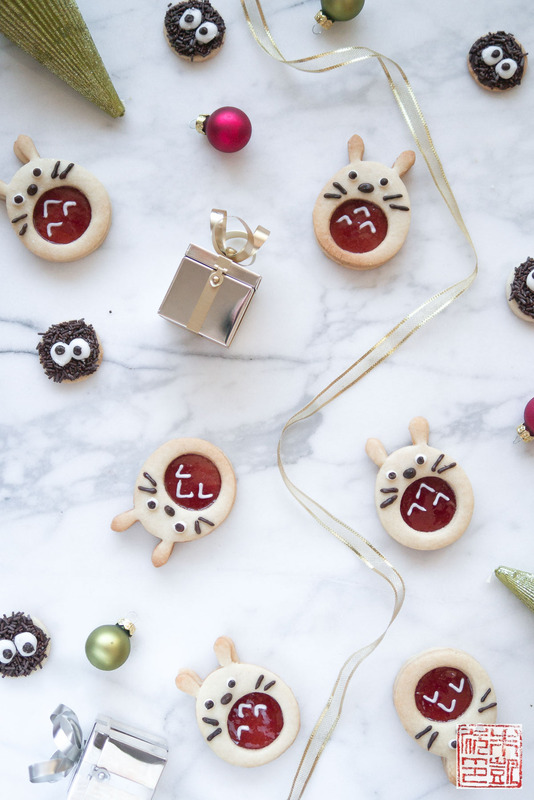 My tried and true linzer cookie recipe, with a couple of small tweaks, made a merry bunch of Totoro-shaped cookies. The dough is delicate, so minimal handling and frequent chilling if turns soft and sticky, will yield the most melt-in-your mouth cookies. My preference for filling is the classic traditional redcurrant jelly, for its sweet tanginess, and its vibrant, perfectly seasonal red color. Its glassy shine also makes it a good decorating surface, so if you choose a different filling, go for a smooth jelly rather than chunkier jams or preserves. Here’s another happy, serendipitous brainstorm: what to do with the cutout circles? I realized they were a perfect fit for another favorite Totoro character: the little soot spirits! These funny little dust balls become chocolate sprinkle-flecked rounds with googly eyes. I rarely get the long stretches of time needed for intricate pastry making anymore. 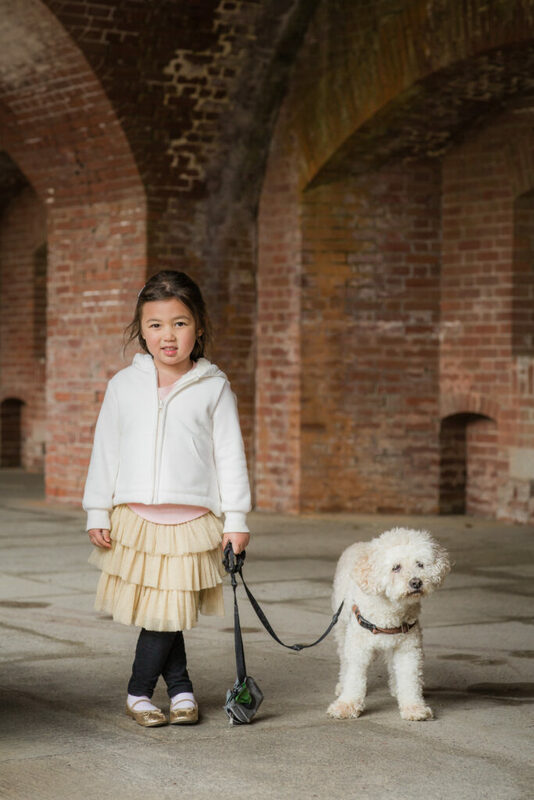 When I was poring over possible cookie recipes, I was actually trying to find some of the easier, more kid-friendly ones. However, hubby gifted me with a long peaceful Sunday afternoon where I could sift and mix, roll out and bake, and sit and decorate to my heart’s content. Space and time for quiet inspiration and to enjoy the pleasure of creation; that’s part of holiday magic too, isn’t it? 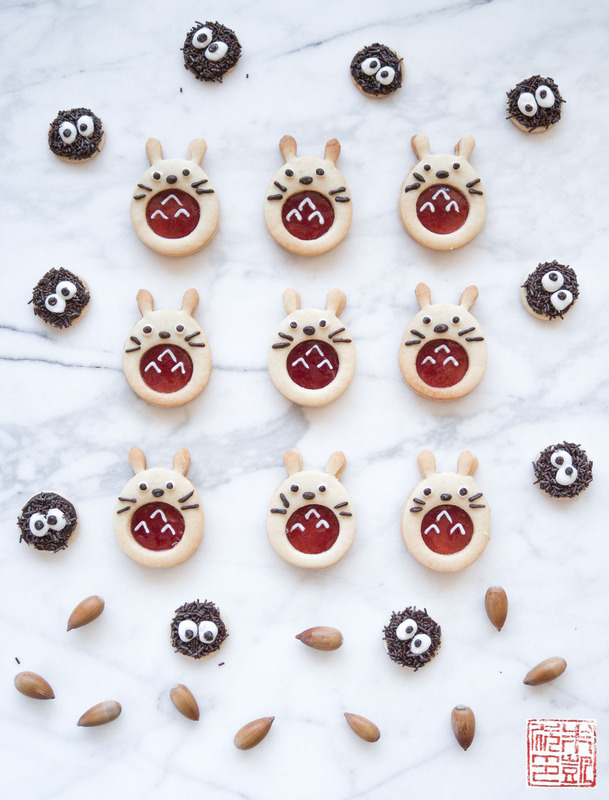 I hope you find these Totoro cookies as delightful as the joy I had in making them. Combine flour, almond meal, ground cinnamon, baking powder, and salt in a bowl and set aside. Combine butter and sugar in food processor and process until light and fluffy, a couple minutes. Add egg and process until combined. Add vanilla extract and process until combined. Add flour mixture and beat on low speed until the dough just comes together. Turn out dough onto a clean surface, divide in half, and form each piece into a flat rectangle about 1 inch thick. Wrap each rectangle in plastic wrap and refrigerate at least 2 hours until firm. Roll dough to about 1/16 inch on lightly floured surface. Cut out shapes with a 2-inch wide cookie cutter. Use a small cookie cutter to make cutouts in half of the cookies, so when you make sandwiches the filling will show through. Arrange cookies on cookie sheets about 1 inch apart. Chill cookies on the sheets for about 15 minutes before baking (This will prevent them from spreading). Bake for 9 to 11 minutes, until cookies turn golden brown and smell like toasting nuts, rotating sheets halfway through. Cool sheets on wire racks. Wait until cookies are completely cool before assembling them. Whisk the confectioners' sugar and egg white together in a small bowl until smooth. If the mixture is too dry, add in a teaspoon or two of milk. It should be thick and slightly stiff, not too liquidy. Place the icing in a piping bag fitted with a small piping tip or in a ziplock bag. Cut off a small corner of the ziplock bag for piping. Place chocolate in a heatproof bowl and set over a saucepan of simmering water. Melt chocolate, stirring frequently to prevent burning. Place the melted chocolate in a piping bag fitted with a small piping tip or in a ziplock bag. Cut off a small corner of the ziplock bag for piping. Spread jam over cookies without cutouts. Place cookies with cutouts over the other halves. Pipe decorations with the royal icing and chocolate. Let set before serving. Store in an airtight container between layers of waxed paper. Thank you so much! I’m honored that you’d be inspired by my baking experiments:) Happy holidays to you and yours! OMG these cookies are so cute! Thanks so much Natalie! Happy holidays to you! Thanks so much Michele! Just inspired by all your amazing sweets! Merry Christmas to you and your family! Nothing is better than home-made cookies… Definitely gonna give this one a try soon, hope it will be tasty for the kids. Thanks! Thanks so much for your sweet comment, I hope your kids like the cookies! Love Totoro. These are so cute. Isabelle is adorable.